Carousel Double Glazed Windows Whinmoor have been providing professional double glazing services and quotes for domestic householders and businesses in Whinmoor for 20 years. Our skilled tradesmen provide a wide range of specialist new and replacement double glazing services that cater for all your needs. For the past 20 years, we've made it our job to become field leading experts in manufacturing and fitting all manner of the most modern and energy efficient double glazed windows. If you come to our friendly team for advice, you'll receive just that - no hard sell techniques, just practical help. Carousel Double Glazed Windows Whinmoor operate from our large factory and office complex, providing bespoke double glazed windows for homes throughout Whinmoor and Leeds in general. We are a family run company, so we're very aware that your home and family need shielding from the elements, shielding from higher electricity and gas bills, and importantly, shielding from any intruders who may happen upon you. At Carousel we ensure that we use all of the recent innovations in window and door security in our uPVC windows to protect you and your family. So all of our frames are not only energy efficient, but they're all made with the latest security features utilising hook-locks, deadbolts and high security door locks. We strive to maintain that all of our staff are highly professional and courteous. Ask around and speak to some of our clients - we supply and install the very best uPVC windows and can guarantee that you'll enjoy the same professional and courteous treatment that all of Carousel Windows Double Glazed Windows Whinmoor customers have enjoyed since 1991. Carousel Double Glazed Windows Whinmoor customers can be assured with our CERTASS registration - it's something that we're very proud of maintaining, and it means that the work we carry out complies with all of the current building regulations that are aimed at improving thermal performance. Something to bear in mind if we continue to have harsh winters and hot summers! 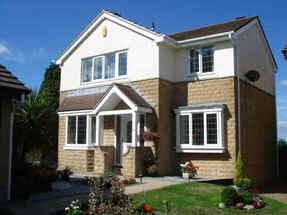 Not only are we experts in the manufacturing and fitting of a whole range of energy efficient windows, but in most cases we can help you with your budget as well, recommending solutions that will offer you the significant benefits that Carousel Double Glazed Windows Whinmoor can bring, but with great value also. We can offer such great value as we make the windows in our factory ourselves so that we can control every aspect of price and quality of your casements right from manufacture to installation. An area like Whinmoor has properties of all ages and styles. We're very well placed to offer a tailored specialist window service to provide windows to suit all types of properties (and pockets). Many houses from around the turn of the last century were built with single glazed sliding sash windows. These look 'correct' on the property, but the frames often warp and rot letting in draughts, and as they are only single glazed, the window's insulating properties are very low. We're now offering double glazed windows in Whinmoor which have all of the great looks of authentic sash windows, but combined with the security, insulation and weather protection that you get from modern uPVC windows. If you're sick of the draughts and the fact that you have to hit the window frame with the heel of your hand to open your sliding sash window, then maybe it's time for a change. For a start, our windows are well balanced and they won't slip or jam or stick. What's more, cleaning upstairs windows becomes something you can easily do yourself. There's a built in tilt feature on these windows which means that you can arm yourself with a sponge and a bucket and clean both sides of the window from the inside of your house.